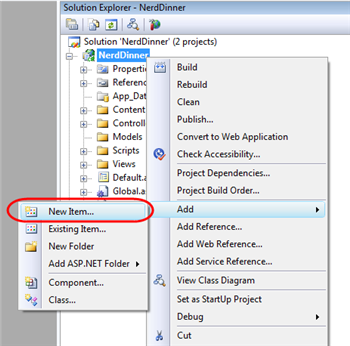 This is step 2 of a free "NerdDinner" application tutorial that walks-through how to build a small, but complete, web application using ASP.NET MVC 1. 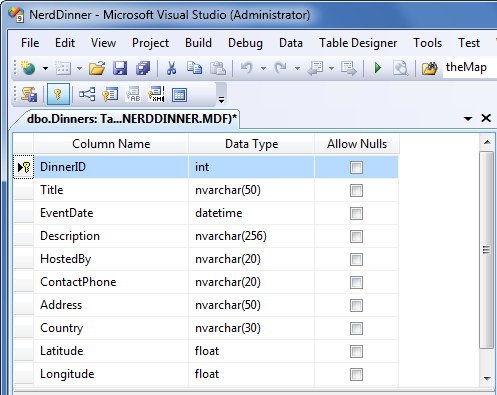 Step 2 shows the steps to create the database holding all of the dinner and RSVP data for our NerdDinner application. 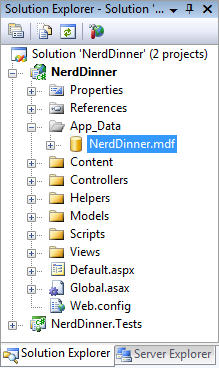 We'll be using a database to store all of the Dinner and RSVP data for our NerdDinner application. 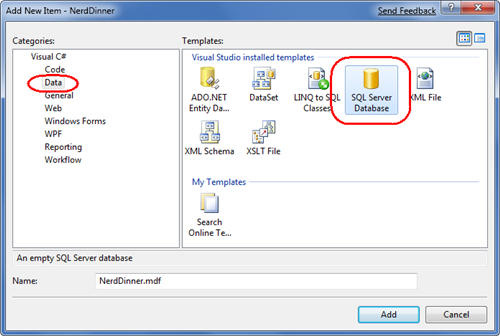 The steps below show creating the database using the free SQL Server Express edition (which you can easily install using V2 of the Microsoft Web Platform Installer). 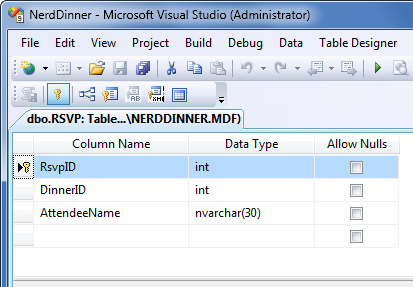 All of the code we'll write works with both SQL Server Express and the full SQL Server. We now have a new empty database. Let's add some tables to it. 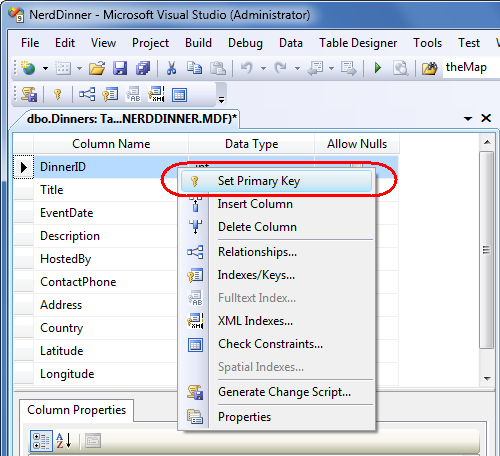 In addition to making DinnerID a primary key, we also want configure it as an "identity" column whose value is automatically incremented as new rows of data are added to the table (meaning the first inserted Dinner row will have a DinnerID of 1, the second inserted row will have a DinnerID of 2, etc). 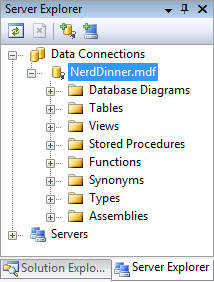 Our new Dinners table will then show up within our database in the server explorer. We'll save it and give it the name "RSVP". 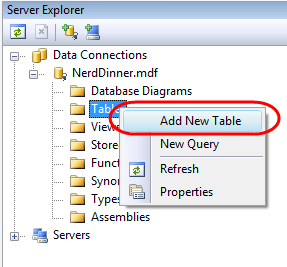 We now have two tables within our database. Our last schema design step will be to setup a "one-to-many" relationship between these two tables – so that we can associate each Dinner row with zero or more RSVP rows that apply to it. 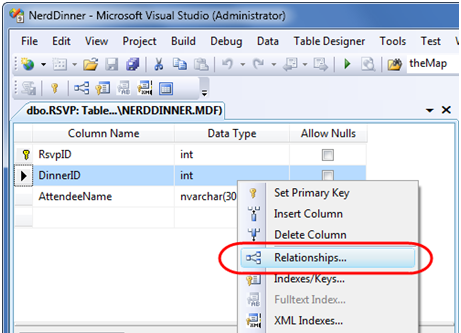 We will do this by configuring the RSVP table's "DinnerID" column to have a foreign-key relationship to the "DinnerID" column in the "Dinners" table. 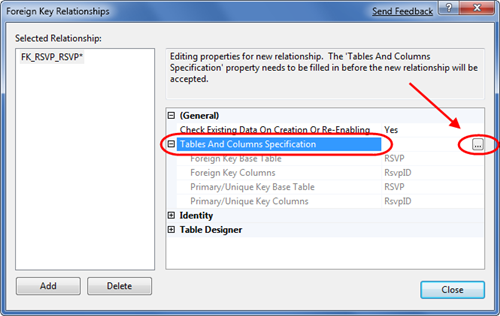 Clicking the "…" button will bring up another dialog that allows us to specify which tables and columns are involved in the relationship, as well as allow us to name the relationship. 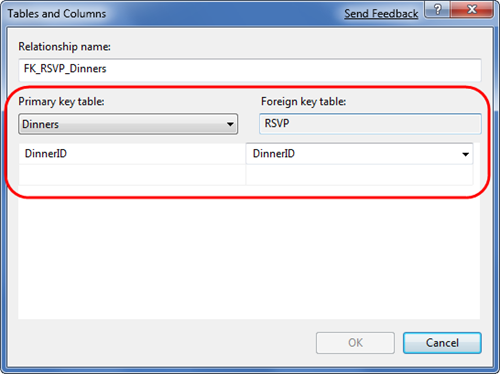 Now each row in the RSVP table will be associated with a row in the Dinner table. 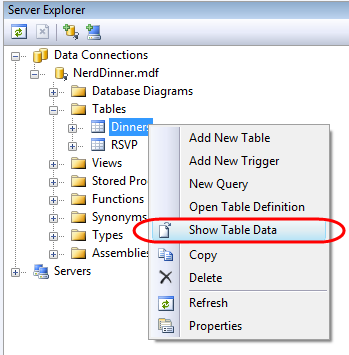 SQL Server will maintain referential integrity for us – and prevent us from adding a new RSVP row if it does not point to a valid Dinner row. It will also prevent us from deleting a Dinner row if there are still RSVP rows referring to it. 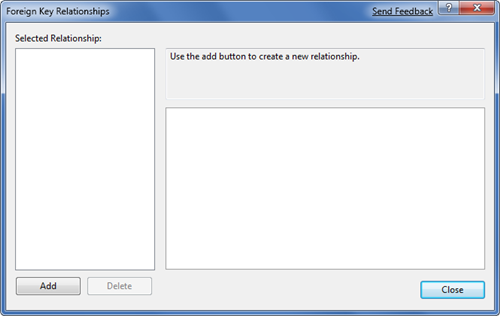 We've finished creating our database. Let's now create model classes that we can use to query and update it.